Bufftech® offers a full line of low-maintenance vinyl picket fences in Traditional, Classic and Contemporary styles. Most of our picket fences feature a steel reinforced bottom rail and a “good neighbor” design that’s equally attractive on both sides of the fence. Cape Cod offers a timeless look that’s available in 3’, 4’ and 5’ heights in white with a pointed picket design. Choose from straight and concave styles. Yorkshire picket fence comes in 3’ and 4’ heights in white, in both straight and concave styles, and includes a dog ear-style picket. Danbury features a pointed picket in straight and concave thru-picket styles. Danbury comes in white and almond in a 4’ height. 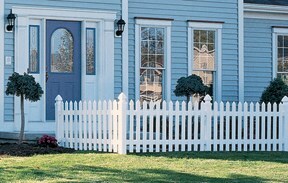 Rothbury is a 4’ high thru-picket fence with a dog-ear picket, available in white and almond, straight and concave. Canterbury features a unique, alternating square picket design in 3’ and 4’ heights in white. Canterbury is available in straight and graduated swoop styles. Manchester offers a sophisticated design with square pickets, available in 3’ and 4’ heights, white and tan colors, and straight or concave styles. The optional Classic Impressions™ posts add a stately touch to the Manchester fence, in a choice of recessed and fluted styles. Baron picket fence is available with either a smooth finish (white and almond) or Bufftech’s Select Cedar authentic woodgrain texture (white and almond). Baron comes in 3’, 4’, 5’ and 6’ heights and is suitable for use around swimming pools. Countess offers a modern take on the traditional picket fence, with its eye-catching arrangement of wide and narrow pickets. Available in 3’, 4’, 5’ and 6’ heights in white and tan, Countess meets most building codes for pool fencing. Monarch is a visually appealing fence style that features alternating wide and narrow pickets and is code approved for pool applications. Choose from 3’, 4’, 5’ and 6’ heights in white and tan. Princeton features a contemporary design with narrow picket spacing in a choice of 3’, 4’, 5’ and 6’ heights. Princeton is also a great option for enclosing a swimming pool and comes in white and tan. Victorian picket fence delivers sleek styling with wide spacing between the pickets. Victorian comes in 3’, 4’, 5’ and 6’ heights in white and tan. CertainTeed has many different styles of picket fences to meet your needs.